President Cyril Ramaphosa has established a Special Tribunal that will assist the Special Investigations Unit (SIU), in recovering monies that have been lost by state institutions and government through corruption and and irregular expenditure. In a statement, the presidency says it will to ensure that those who are responsible for the loss of monies and or assets by state institutions are held accountable. The office of the President says the litigation process includes both public and private sectors, persons and entities. The powers and functions of the Special Tribunal are to adjudicate upon any civil proceedings brought before it by the SIU. Judge Mlindelwa Makhanya is the president of the Tribunal for a period of 3 years. Additional members include, Judges Icantharuby Pillay, Johannes Eksteen, Peter Mothle, Lebogang Modiba, Thina Siwendu, David van Zyl and Sirajudien Desai. 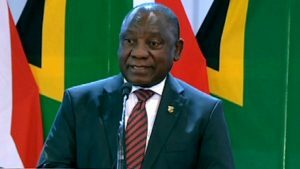 The post Ramaphosa establishes Special Tribunal to assist SIU appeared first on SABC News – Breaking news, special reports, world, business, sport coverage of all South African current events. Africa's news leader..